I'm attending the International Society for Technology in Education (ISTE) conference for the next couple of days. While I'm here, I'm planning on hanging out at the Google booth (so if you're also at the conference, come by and say hi!). But more importantly, when I go to a conference like this, I always enjoy talking with--and interviewing--the conference attendees. As a group, ISTE folk are teachers with experience in technology use, librarians trying to get a handle on where scholastic library technology is headed, and technology coordinators for school districts. These folks are endlessly interesting, and they spend a LOT more time talking with kids than I do.. so I like to interview them and pick their brain, get their insights about how students are using (or not using) search and research skills to help get the job done. * how DO students search? * how do teachers search? * what skills are they missing? * what research skill do have in abundance? * what else should we be teaching? But let me put it to you. What do you recommend I ask? As you know by now, looking up parts-of-words, like suffixes, isn't a "natural' operation on a search engine. So you have to think a bit about what it is you're really searching for--is it a specific term, or a specific string in a role? This is especially interesting when searching for things like suffixes (such as, -KILL) that occur commonly on place names. Note that I did NOT prefix the "kill" by a minus sign (as I wrote in the challenge). That will REMOVE all mentions of "kill" from the search results... which really is NOT what you want! The results page was pretty good with a couple of links to Phrases.org.uk (a language compendium and discussion forum started by Gary Martin in 1997) and a link to the Wikipedia article on List of tautological place names. The Online Etymology Dictionary agrees: "kill" as a suffix is derived from the Dutch kille, meaning river or riverbed, especially used in place names--Fishkill, Beaverkill, Catskill. So... I take three lessons from this challenge. First, describing the role is sometimes a useful strategy. In this case, it was just adding the word "suffix" to my search. Three, looking at multiple sources looking for agreement (or disagreement) is just about the only way to be sure that you're finding a reliable version of the story. In this case, we had complete agreement, so it was a slam dunk. You should know that other languages have different ways of appending / inserting / prefixing words together. The easiest example I can think of is the Spanish word "dimelo" (which means "tell it to me"). From an English-only speakers perspective, this is an interesting word as it combines three "words" into a single term. "di" (literally, "say" from the verb decir), "me" meaning "to me", and "lo" which means "it." Lots of languages do this kind of thing. (Finnish is a particularly interesting example. More on Finnish another day.) But from the perspective of this Challenge, how would you search for a word/term that's buried in the middle of the word? That is, suppose you find a common string that occurs frequently in the middle? It's not a suffix... it's a... WHAT? We'll talk about this in another post--but the answer has to do with learning enough about your topic to be able to ask questions in a useful way. Let's call it "just in time expertise" for the moment... and how to search for the information you need to become just enough of an expert to answer your burning questions. Wednesday Search Challenge (June 23, 2010) - Pennsylvania River Names? Last week I was driving through Pennsylvania, crossing the state when I noticed something interesting and odd--many of the streams and rivers seem to end in -kill. Consider... the Fishkill River, the Schuylkill River and so on. So I naturally started wondering--Why are PA rivers given names like that? Were there a succession of "kills" of various kinds of fish (a la "Fishkill"), or is it something else? It's a good search problem. Not terribly hard, methinks, but an interesting one. How would you solve this search problem? Why such odd names? This week I helped teach a group of 20 kids our usual "Basic Web Search Skills" class. An important part of that class is learning how to use Control-F to find text on a web page. Knowing what to search for with Control-F is a tricky skill to teach. I say that because one of the problems is to "Find Dan Russell's time in the Juana Run results from 2009." We'd navigate to that page, then search for my name. That sounds obvious, but lots of students were unable to find my name because they'd search for the string "Dan Russell" -- but in fact, my entry in the race results is "Daniel Russell." An important, but subtle distinction. They'd start the search, and then fail... and not know what to do next. of the text you're searching for. Why do I say it this way? Because I frequently see people in my classes who can't find something (via Control-F) in the text, even when it's clearly there. 2. least common - by which I mean "unusual" or rare in the text. Why? thing you're really looking for. And of course, be sure that the "Match Case" option is off as well. So, for this example, I told people to search for "Russ" -- you'll get a few extra hits, but you'll avoid the confusion with possible alternative spellings of my first name, and you'll avoid the misspelling of "Russel." In another example, I have students search for the word "maquette" in a long document. But rather than search for the entire word, I have them look for just "maq" -- that'll get you to the desired term (it's short, low frequency, and avoids the problem of the author not knowing if the word has 1 or 2 T's in it). If you slipped me a knockout drink, dragged me off to a remote location and I’d awoken in the velvet black of a deep cave, I could still instantly recognize smells in the dark cavern. I could tell you that this was the scent of a California buckeye in flower, or that would be the aroma of New York lilacs blooming in sunlit field in May. Some things are always recognizable, even out of context or widely separated in time. And this makes me aware of one of the key skills of sensemaking... that of knowing what to recognize, and how that recognition fits into the larger understanding of things. I often think about how we perceive patterns in the world, and the ways we talk about them. Usually I write about trees, flowers , streams changing over time. I think about the ways I feel the patterns of hills waving beneath my feet as I pass lightly over the surface. I see the passage of time in the layers of rocks exposed in a roadside cut. So this “perception of pattern” thought was of great interest when I went to hear the men’s chorus Chanticleer perform. The centerpiece of the evening was Orlando di Lasso’s mass “Tous les regretz” (yes, that’s spelled correctly—it’s old French). Come hither to me, wherever I may be. And cleave it twain when suddenly I see her. It’s an appropriately somber song that describes earthly love and heartbreak, so it’s not a stretch to remake it into a mass setting. To hear Chanticleer singing the music of Orlando in the vast reverberant space of St. Joseph’s cathedral in San Jose was marvelous. Their pitch is perfect, the performance stunning, and the music itself… well, it’s 16th century polyphony as written by a master. It’s hard to imagine anything more transcendental. It was just wonderful. But although I consider myself a decent musician, I found it VERY hard to hear Gombert’s theme for more than a few seconds in the mass before it became lost in the intertwinings of voice and counterpoint figures. I listened, trying to hear the melody, following one line for a moment, then following another, all the while hearing the gestalt. Listening like that is a whole-mind engagement—you can’t just set it into the background. It’s mentally wrestling with the music, hearing deeply into the core of the performance… hearing fragments of motifs, being surprised when a new theme is introduced, being happily reminded of a familiar fragment when it returns. I love the complexity, the convolution of heartfelt song and cerebral musicsmithing. Orlando’s time was an age when the composers would insert all kinds of wordplay and counterpoint play—crossing melodic lines to indicate the cross, a sudden ascent to suggest a rising to heaven, with a corresponding leap octaves downward as the plot is betrayed. There’s no getting around it, the music is simultaneously complex and while also immediately perceivable. But at the same time, it’s unclear where the theme goes. It starts at the beginning of the Kyrie, then is swallowed up by the interlocking voices. I listened. The Kyrie ended. The Gloria began. Then comes the Credo. And I suddenly understood where the recognizable themes have gone. I was raised in a Lutheran church, the church of the Reformation. And although Martin Luther left the Catholic church, the Lutheran church carried over many (many!) elements from Catholicism. One of them was the Credo. As it turns out, Lutherans have two Creeds that they recite—the Apostolic Creed (which is used for common expressions of faith) and the Nicene Creed, which is rarer, partly because it’s longer and partly because it’s just more complicated. To tell the truth, I always preferred the Nicene Creed because of the beauty of the language. But consider this: it was written in 325, in Greek, in the city of Nicaea, then translated to Latin, then translated to English by the biblical scholars working for King James. Lutheranism was famous for making biblical texts (including creeds) into common language (which would have been German). And so Lutherans in America ended up adopting the language of the English court of King James (1611). How odd is that? Kids in cathecism classes learning 17th century language of a transliterated Latin text that was translated from the Greek. Many, many arguments about these particular words (in all of the languages) have been fought. And so it was a little bit of a surprise to be listening to the music of Orlando, and to recognize the Nicene Creed being sung to me in that bright, resonant space. Oh, I wasn’t surprised by the Credo being in the mass, but I wasn’t ready for the shock of recognition as I listened to the Latin text. So, moments later, when I heard the Latin text “Deum verum de Deo vero” in the music, I *perceived* that phrase as the “very God of very God” sense of the text. That now odd, but very distinctively resonant phrase that rattles my sense of recognition. While I was listening to the music, that phrase instantly spun me down a memory hall of recollections about the Court of King James, translations and battles over what the “one true God” really meant. What IS / Who IS the “Deum verum do Deo vero”? By this point, the original Gombertian theme I had been listening for was long lost in the music. It’s all skeined together—warp and woof of melodies playing against each other, and I’m feeling a deep sense of recognition from something I had studied 40 years ago. Memories re-illuminate, synapses re-fire, the past comes flooding back into the present. To tell the truth, I am now an agnostic, one who finds the whole of religion to be deeply suspect. At the same time, I cannot deny that this music and this language touches some part of me deep inside, a place where rational thought is only a dim light off in the distance, hidden by the obscurations of old learnings, practices and teachings. I still love the sounds of chant and the majestic polyphony of Orlando and Palestrina. I can no longer hear the original themes of either Gombert or religion, but that’s fine. I still have the sense and sentiment of both, and that works perfectly for me. I can still recognize the patterns from long ago, and in so doing, revisit and make a kind of sense out of all those layers of history, time and change along the way. Unfortunately, not everything is on the web, and an important part of research skill is knowing how to navigate over information that's NOT in the Google index! A good deal of this kind of "official information" is in the deep / dark web. This is just one of those things you've got to know: To look up information about a parcel, you'll probably need to go look at the tax assessor's records. Nearly all counties in the US have a tax assessor's office with online records. Unfortunately, they're all different, with little consistency between them. Luckily, the method I outline below is doable in many other places with a little revision. ...which gets you to the county's web site with the maps. 2. Navigate through the website to the parcel database. 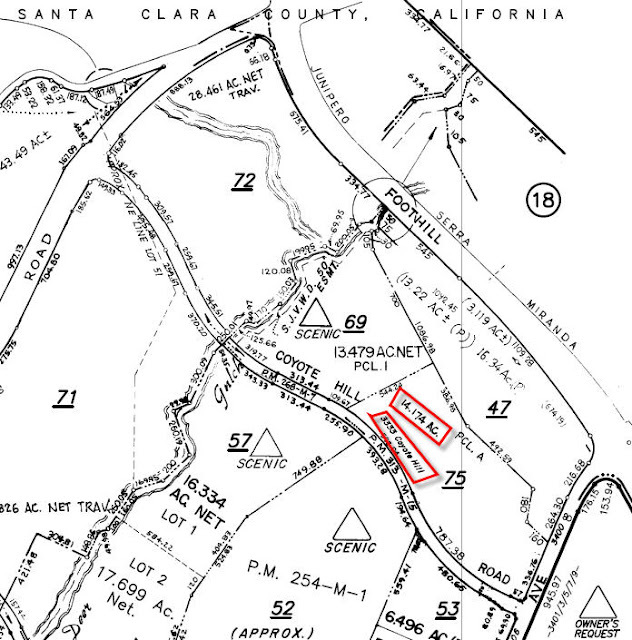 ... there, you'll find a link labeled "Look up property records"
"County of Santa Clara ARI"
3. Click on the link labeled "Assessor map"
... county (or city) on it. And... the one thing you've got to know is that Assessor's maps also have a great deal of extra information--such as acreage per parcel. In this case, you can just look at the map and read off the acreage. I've had people in my classes complain that "all you're doing is teaching us tricks!" I wish there was a deep, rich, meta-theoretically clean model I could give you -- but the truth is, a great deal of being a great researcher is knowing what's possible to find, and how to find it. In the general case of tax / city / county plat information, you've got to go mine it out of the county's deep web. But at least now you know how! I live in Palo Alto, the home of Stanford, the previous home of Google, and the heart of Silicon Valley. Yes, some might think SiValley is in Santa Clara or Sunnyvale or Cupertino--but for many of us, it's Palo Alto. I've worked in several different buildings in Palo Alto, but probably none quite as well known as PARC (aka Xerox Palo Alto Research Center). Wikipedia has a nice, balanced article about PARC, or you could go check out PARC's current web site. But overall, it's not that big of a place. At it's peak, about 300 researchers worked there. That's a lot of ideas per person. How many acres is the PARC site? Your answer should be precise down to the tenth of an acre.